Virtual Staffing services have been in existence for almost half a century now and still there are doubts and misconceptions which are hovering over the concept of virtual assistants. Most who have heard about the virtual assistants hardly know what these virtual assistants and what they are not. There are others who do not even know why they should hire a virtual staff. The traditional and old notion of an assistant stands firm here and will help you deduce the basic meaning of a virtual staff or assistant. Similar to a secretary who can take down notes from you, schedule your meetings, sort social routine, handle your clients in your absence, make emails and calls, etc. The virtual assistants (VA) also handle chores of similar nature and provide a helping hand to you and your business. Though, the present day assistants are far more technically sound and trained and are capable of handling multiple tasks. The notion of virtual assistants came into existence when the small and medium sized companies started coming up and they were looking for reducing their running cost without sacrificing on quantity and quality of work. 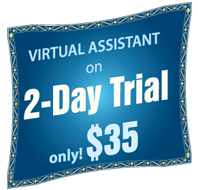 Since then, the Virtual Assistants are dedicated at provided services which are of high quality and priced very less. There are tons of benefits accompanied with the hiring of VA.
Design a website or a blog. To manage your websites, blogs or any other service. Need a content writer who can write content for your blog and your website. Need some research to be done and a report to be compiled on the same. Create social media profiles or do promotion of social channels. Do on-page or off-page Search Engine Optimization for your blog. Create a sales funnel and do copy-writing. Advice on expanding your on-line or off-line business. Create link wheels or link pyramid or do any other specific task. Design graphics, fevicons, logos, animations, etc. The above given works are most associated with the business associated with Internet, but there are VA for all sort and types of businesses. For instance, those associated with the notary business are capable of doing proper paper work, handle or consult the clients on phone, etc. Hiring a Virtual Assistant can be a very beneficial deal for you, as you gotta pay only for the time you want them to work for. If you do not like the work or have any other thing in mind, you can fire the virtual staff immediately. It’s very hard to get a VA who can act like a terminator for you and your business. Never expect that a single virtual staff can solve all your dilemmas. There are dedicated virtual assistants who provide different services like administrative works, technical assistants, data-entry level jobs, etc. The benefits which accompany a VA are soon gonna help you realize that you should have gone for a VA much before this.